City officials gathered at the Long Island City’s waterfront this morning to celebrate the opening of Hunters Point South Park Phase II. The new portion of the park, which opened to the public on June 21, spans 5.5 acres from 54th Avenue around Newtown Creek, bringing the park up to a total of 11 acres. The expansion cost $100 million to build out, and took three years to construct. Phase II focuses more on nature and the environment than the first portion of the park, taking on a feel of a quiet, urban oasis. The new park includes pedestrian and bicycle pathways, a public art piece and playground, wooden seating areas, and wetlands. “Every New Yorker has the right to access world-class parks and public spaces. With new parks like Hunters Point South, Bush Terminal, and Bushwick Inlet Park we’re making sure that as our neighborhoods grow, our public spaces grow along with them,” said Mayor Bill de Blasio in a statement. NYC Parks Commissioner Mitchel J. Silver, noted that the park has come a long way, given what the Long Island City area once looked like. With the waterfront park all built out, the remainder of the Hunters Point South residential development is next. Developers are expected to break ground on two additional buildings along the waterfront in 2019, with construction on another set of towers near the Oval set to begin this month. The entire Hunters Point South development, when complete, will span 30 acres and hold up to 5,000 residential units. The developers and our mayor want to bring in a trolley from Brooklyn through Astoria. They want to build a High-Line Park on the abandoned elevated “Montauk” line in LIC. They want developers to build housing, schools and a park on the shores of the super fund Newtown Creek — once the creek is cleaned up. As a 20 year resident of LIC all I have seen is my property taxes go up, I have seen local hotels converted being filled with homeless, hotels built for short term stays not to house long term residents with their children. I have seen working class families being pushed out because rents are out of reach, I have seen speculators purchase one and two family homes and become absentee landlords and seen these home turn into illegal rooming houses and fire traps with 20 people living in one home and a tons of garbage and mattresses being tossed onto the street. More trash, more people, less space, more crime. Our neighborhood is choking, our local politicians (JVB and Catherine Nolan) are worthless and the top prize is the huge Sunnyside Yards is up for grabs to the highest bidder. I sure hope the LIC Landing folks or another concession are barred from the new “wild” and peaceful play, kayaking and walking areas. The concession has blasted loudly into play areas of the City park and the Landing, and enclosed the Parks open wooden platform as their private property, installing beer spigots. The enclosure is a pen, possibly a fire hazard, as there are no exits except a leap over, and an eyesore. Next to (south of) the other LIC waterfront parks. The so called city planners and the city council members plus the mayor have done a woefully inadequate job of planning. Just look at the facts big real estate developers can build out of scale apartment buildings that increase the population far beyond what our transit system can handle. Now they want 10000 more units how are these people going to travel and where will they shop for food and what about schools for their children. Enough already the city needs a time out. No more changing land use and no more magazine buildings there are too many people here as it is! Does anyone believe that the council members aren’t raking in money in the form of campaign contributions and promises of employment when their term limits have been reached! Exactly where is this park. I am not able to quite place it and would love to visit the park. River and the odorous New Town Creek Superfund site. 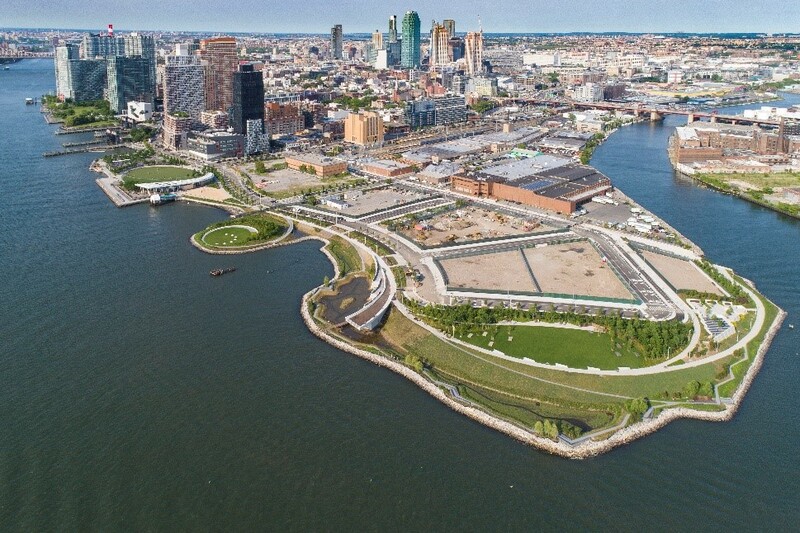 By the way, the city is hard at work on these parks- but what about the future Bushwick Inlet park site? It’s lying dormant and fenced off, with no apparent work.